Well, I wonder if cookies shaped like apples count, because that's what I plan to give my kids' teachers this year. Cut out the cookies. 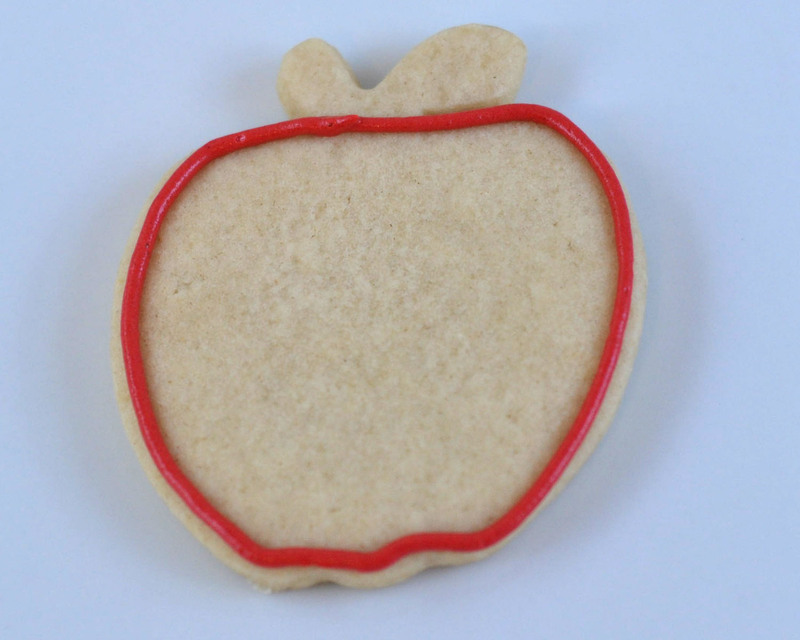 Remember to use a sugar cookie recipe that does not spread in the oven. That's why I like my Vanilla Sugar Cookie Recipe. It spreads very, very little. To cut the apple with a bite out of it, cut the apple out. 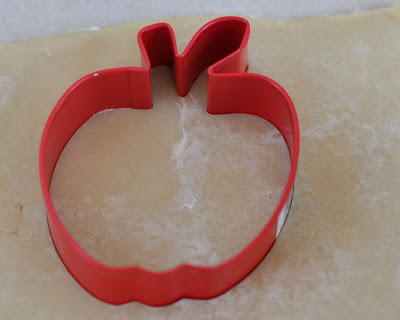 Then using the small fluted-edge or small flower cutter, cut a "bite" from either side (or from both, if you want). Remember to place the trays of cut-outs into the freezer for 15 minutes (no longer than 20 minutes) before baking as this helps keep them from spreading. You need to thin the remaining half of your red, green and brown to a "flood consistency." This means you add water about 1/2-1 tsp. at a time until you drop a drop of icing into the bowl and it "disappears" into the icing in the count of 10. 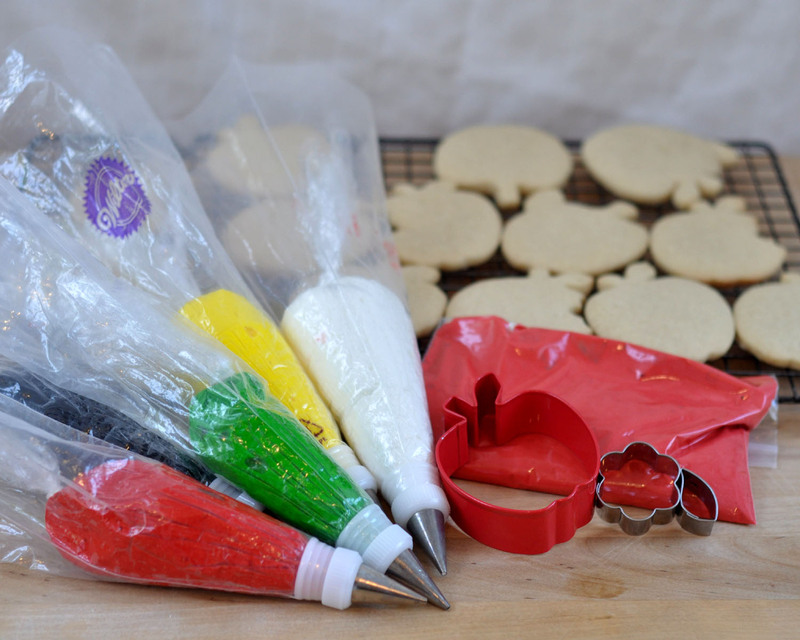 Load that icing into disposable zip-top bags for flooding the cookies. 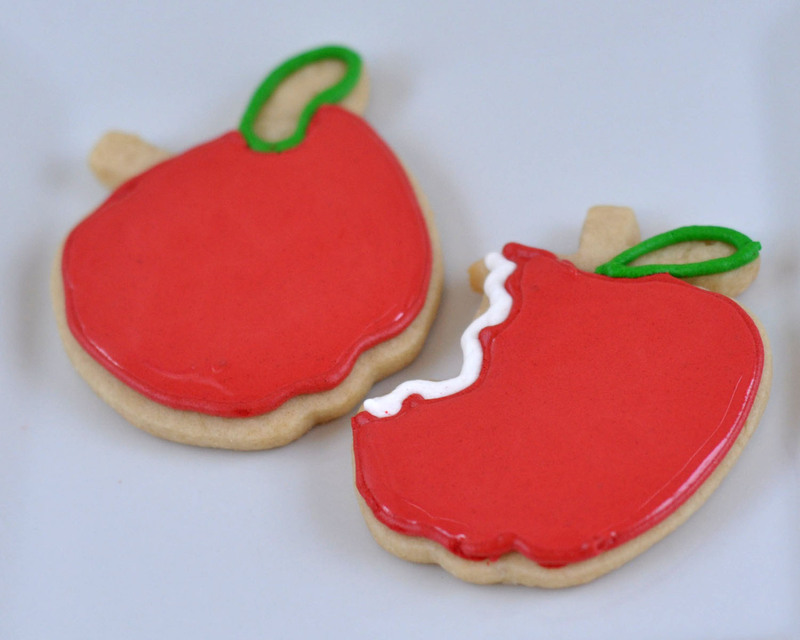 *Note about royal icing: Royal icing hardens (or sets) very quickly. So, you need to keep all of your bags, tips and bowls of royal icing covered with a damp paper towel at all times. If you do find that the icing won't come out when you squeeze, don't use all of your might to squeeze it out or you could blow out and ruin your bags. Remove the tip and rinse under hot water to get the clog out, or use a toothpick. With the zip-top bags, just use that damp towel to clean off the hole. Begin by outlining the red of the apple shape. Use your tip #3. Hold your bag at an angle so that the back of the bag is pointing at your chest or at your right shoulder. 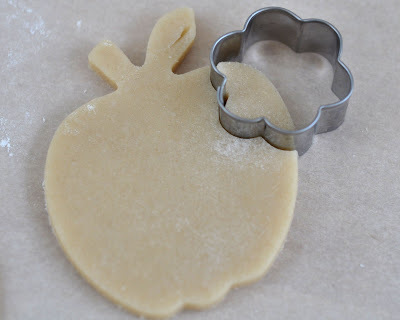 Let the tip lightly touch the surface all the way around the cookie so that you keep the outline in the perfect shape. If I try to hurry and pull it off of the surface, I find that I get straight lines where I want curves to be. 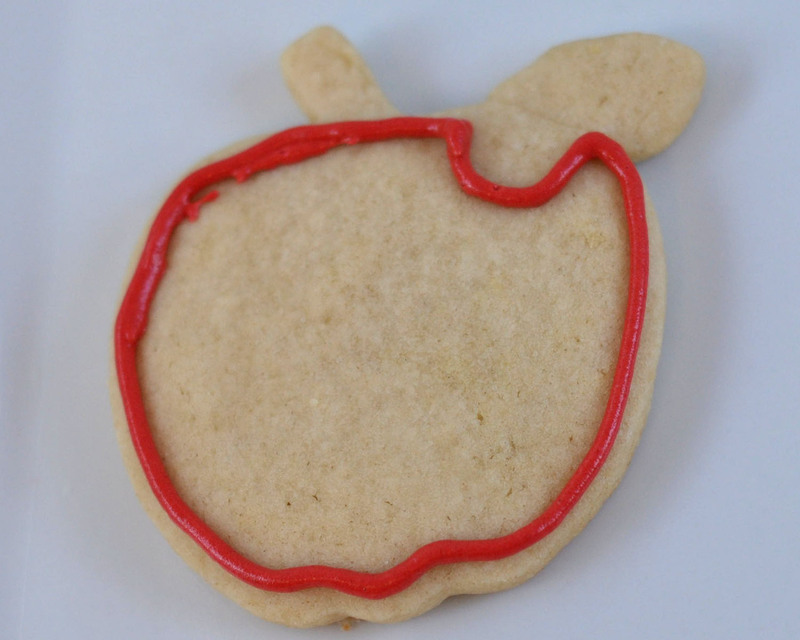 *Note: Be sure you make the little "dips" for the bottom of the apple, and for where you will add the stem. For the worm cookies, be sure you leave an indentation where your worm will begin in the apple. 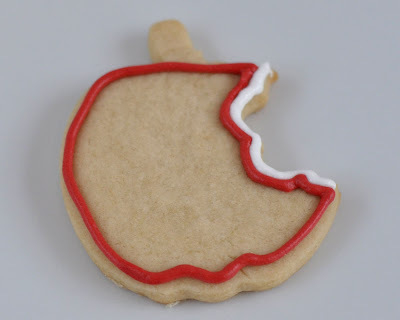 For the cookies with a bite out of them, leave room along the side of the cookie between the red outline and the edge for a white outline of the bite. Add the white outline to the outside edge of the "bitten" apples. Add your green outlines (worms and leaves). *Note: I would have followed with my brown outlines, but I forgot to make the brown at first. Oops! So, I had to go back and add that later. To flood the cookies, cut a small hole (the diameter of a small grain of rice) in the corner of the bag. 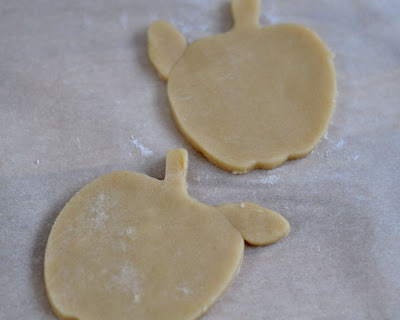 While you gently squeeze the bag, keep that hole immersed in the icing, and spread/push the icing around the outline to fill it in. 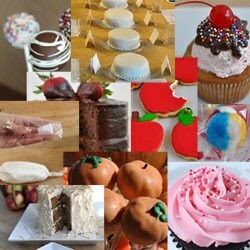 If you need to, use a toothpick to help spread the icing into small crevices. I would start by flooding the red, then do the green and the brown. 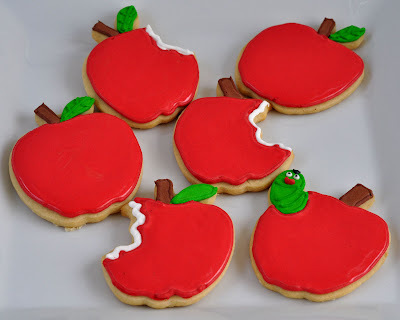 If you want to add a little "accent" on the apples, I would do it while the icing is still wet. 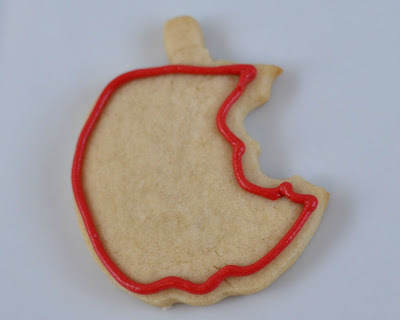 Use your tip #3 on white icing, and pipe a small backwards comma shape in the top left "hump" of the apple. Adding this while it's wet means the accent will sink into the icing more than stick out on top. 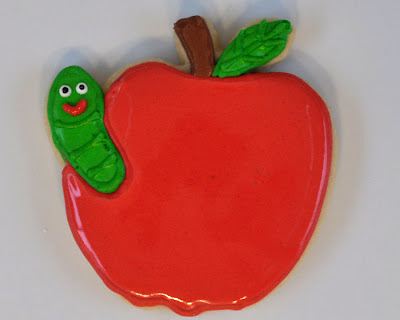 To add the accents on the leaves and the worms, use a tip #2 or 3. Add lines, eyes and a mouth for the worm, and add the veins in the leaves. 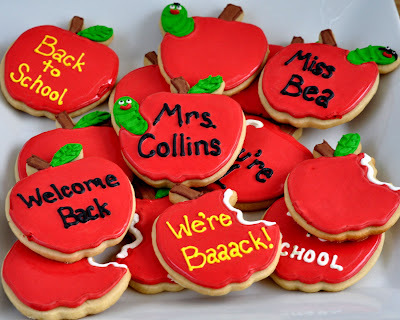 If you want to write on the apples, I would wait until the red has had a while to set and dry before adding it. The black may bleed into the red if you don't wait. Be sure your apples are completely dry before you try to stack or store them.